Bike Racing for Juniors is the first and only book to equip young bike racers for competitive racing. The success of young riders like Andy Schleck, Bernhard Kohl, and Mark Cavendish in this year's Tour de France highlights recent advances in training and racing for junior and espoir racers. In today's cycling environment, it's more important than ever for young riders to balance the physical and emotional demands of racing. From nutritional requirements and stamina limitations, Junior (under-18) and Espoir (under-23) athletes are different in significant ways from veteran racers. Authors Kristen Dieffenbach and Steve McCauley consider all the needs of young cyclists, from skill building and weight training to psychological development and injury prevention. 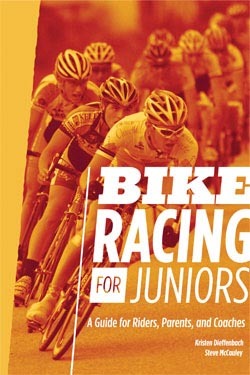 Bike Racing for Juniors addresses the importance of a young athlete's environment, with chapters dedicated to parental involvement and positive coaching strategies. The book outlines the unique rules of Junior and Espoir racing, and explains the timeline for progression from beginner to experienced racer. Tomorrow's pros can rely on this book for the background and preparation they need to succeed in cycling. Kristen Dieffenbach is an is an elite-level USA Cycling certified coach and associate professor of athletic coaching education at West Virginia University. She holds a PhD in exercise science with an emphasis in sports psychology. Currently, Kristen serves on the advisory board of the USA Cycling coaching education committee. Steve McCauley is director of Junior Athlete Programs and a certified USA Cycling coach. In his 8 years with USA Cycling, McCauley has worked closely with the sport's up-and-coming talent, including USA Cycling's Development Foundation, as well as its collegiate cycling and membership and athlete programs. In the 2008 Tour de France ended last weekend, 26-year-old Bernhard Kohl (Gerolsteiner) won third overall and King of the Mountains, 23-year-old Andy Schleck (Team CSC) won Best Young Rider, and 23-year-old Mark Cavendish (Team Columbia) won four stages. USA Cycling recently reported that its membership between the ages 16 and 18 years old is reaching its highest level since the 1980s. Adult participation in racing is also at an all-time high in the U.S.
Over 23 million Americans between the ages 6 and 24 rode a bicycle in 2006. Those participants averaged 75 rides per year. A market research study of readers of VeloNews, the leading competitive cycling magazine in the U.S., shows that 41% of VeloNews readers have at least one child under the age of 18. VeloPress is an endurance sports and fitness publisher focusing on the sports of cycling, triathlon, and running. VeloPress training books help both serious athletes and beginners build skills and fitness. VeloPress is the book publishing division of Competitor Group, Inc., publisher of VeloNews, Triathlete, Inside Triathlon, and Competitor magazines; producer of Elite Racing marathons and half-marathons and the Muddy Buddy adventure series; and owner of VeloGear, an online and catalog retailer.